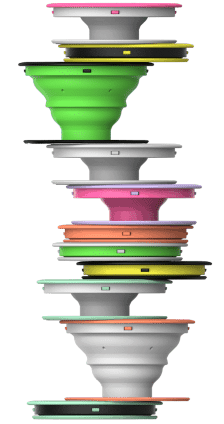 PopSockets Grips are an accessory for your mobile devices that expand and collapse by way of an accordion mechanism. Add a pair of the grips to the back of almost any mobile device to transform its capabilities. 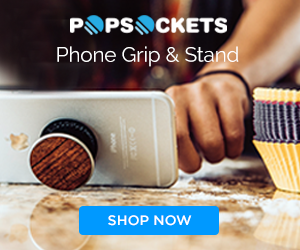 PopSockets Grips “pop” whenever you need a phone grip, a phone stand, a headset management system, or just something to play with. When not in use, the grips take up barely any real estate on the back of your phone. Some people prefer to use a single PopSockets Grip on their phone, while others prefer a pair — you can try it both ways and see what you like. They come with an adhesive pad which attaches to the back of your phones, tablet, or phone case with a thin layer of reusable adhesive gel — it is removable without residue and is repositionable. I currently have a PopSockets Grip on the back of my iPhone case, which I use mainly as a phone grip. The chances of losing my grip and dropping my phone are much less now that I have a PopSockets Grip on it. It is simply easier to hold my phone when my PopSockets Grip is attached. I also can be caught fidgeting with my phone grip whenever I get a chance — popping it up then pushing it back down — so addictive. They really are the perfect fidget. When I ordered I was blown away with all the options. They offer over hundreds of fun designs, from hearts to flowers to skulls. They also have some awesome new lines available such as Stranger Things PopSocket Grips and Swarovski PopSockets Grips (my fave). If you would like more of a one-of-a-kind PopSockets Grips, you can even upload an image to make your own Custom Popsocket Grip – only at Popsockets.com, AND with Free Shipping! For the most options to choose from, order directly from PopSockets.com. Get 50% off any of these PopSockets Grips when you use code VIP50 (through 9/15/18). Girl, I am in LOVE w/ my PopSockets….seriously. I have 2 on 1 phone and 1 on another. I can’t imagine using a phone w/out them. I’ve never heard of popsockets, but I def want to check them out. This is totally something I need. I haven’t heard of these! They look really cool. I need one for my phone. Never heard of these, but it looks cool and easy to use. This is actually pretty cool! I know my fiance would love to have this because he is always complaining about not having a stand for his phone! These work great! I am ordering my daughter a custom made one with her fav celebrity’s pic on it. She’s going to love it! !